To provide insight into how the built environment influences well-being, The Conference Board of Canada partnered with DIALOG to publish Community Wellbeing: A Framework for the Design Professions. The goal of this work was to create a framework that design professionals, including urban planners, architects, landscape architects, interior designers, and engineers, could use to understand and leverage this thinking into their work from conception to evaluation. 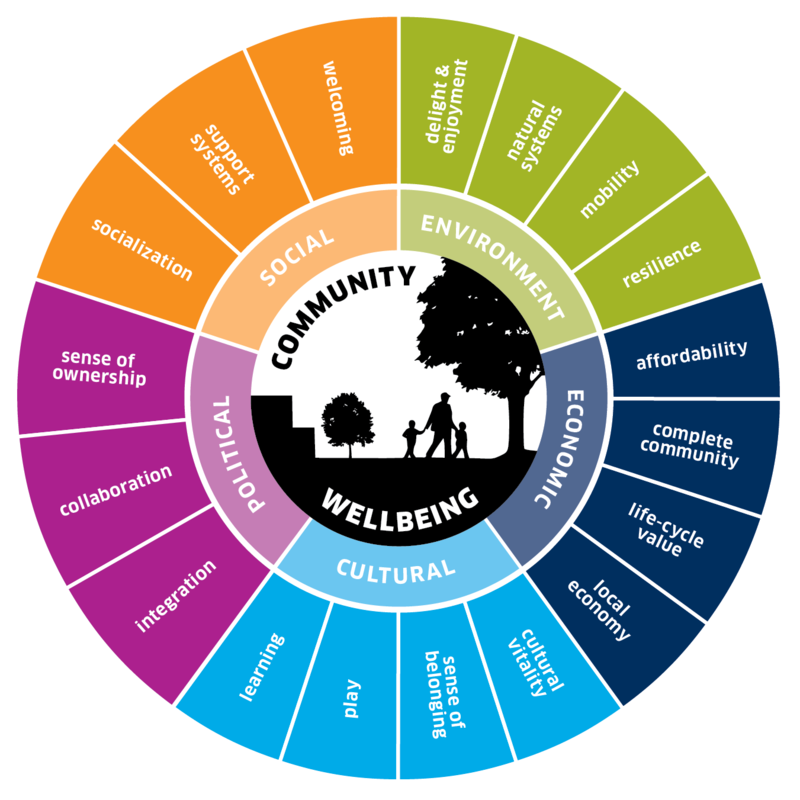 The tool, referred to as the Community Wellbeing Framework (see Exhibit), is intended to guide the design of the built environment to enhance the quality of where people live, work, learn, and play by encouraging conversations about how to design for well-being and by facilitating ensuing decisions related to the design of buildings and spaces. The Framework is also suitable for use by other stakeholders,including public health practitioners. The Framework consists of five domains related to the social, environmental, economic, cultural, and political conditions that influence individual evaluations of well-being. The social domain refers to opportunities created by the community that allow the individual to participate in community life. The environmental domain refers to design features oriented at sustaining and enhancing natural systems, such as by improving air quality and maintaining biodiversity. The economic domain focuses on creating design projects that promote equitable and sustainable communities. The cultural domain is aimed at discovering ways the built environment can be used to promote cultural activity. Lastly, the political domain aims to provide individuals with opportunities to become stewards of their communities and, by extension, of their personal well-being.Each domain is defined by a set of indicators, which are qualified and quantified by metrics developed to assess each indicator. The Framework contains a total of 18 indicators and 48 metrics. What’s Next for the Community Wellbeing Framework? The Community Wellbeing Framework is the first of its kind. Thus,it will continue to be refined as it is applied to design projects in the field. Currently, the Framework has been applied to three Canadian design projects, which are the Durham Regional Police Complex, the Kahanoff Centre/Decidedly Jazz Danceworks project in Calgary, and The Banks project in Saskatoon. The findings from these case applications will be published at a later date. As part of the current trial phase, we encourage a broad application of the Framework and ask that users share their experiences with us, as it is the intent of both the Conference Board and DIALOG to continue to develop and refine the Framework through further research, pilot projects, and the input of other users. In particular, we are looking for additional insights and perspectives, including those from the lenses of accessibility, mental health, and Indigenous communities. Please contact Thy Dinh by phone at 613-526-3090 ext. 440 or by e-mail at dinh@conferenceboard.ca. 1 Public Health Agency of Canada, The Chief Public Health Officer’s Report on the State of Public Health in Canada, 2017: Designing Healthy Living (Ottawa: October 2017), accessed July 27, 2018.